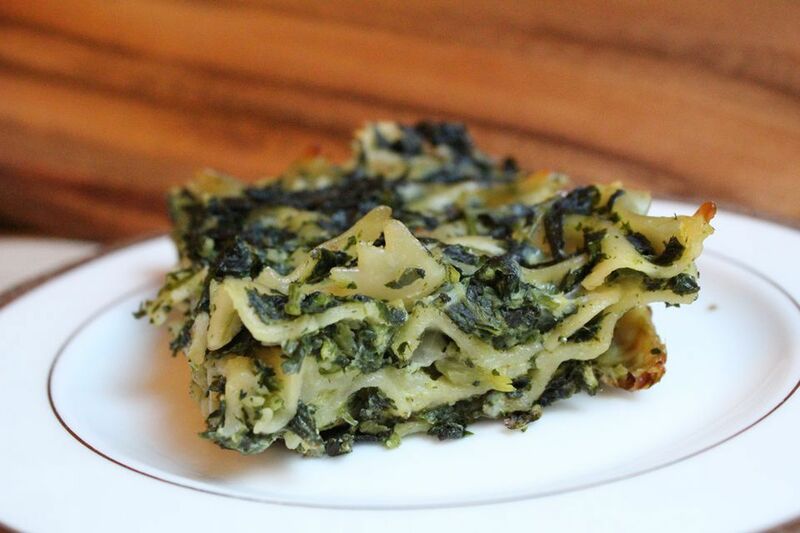 Giora Shimoni's dairy free Spinach Noodle Kugel makes a nice side dish for the Sabbath or holiday table. Fresh spinach and lots of onions add a homey, wholesome feel to this kugel; the simple flavors make it a good complement to all sorts of entrees. Preheat the oven to 350° F (180° C). Oil a 9 x 13 x 2-inch baking dish, or spray with non-stick cooking spray. Bring a large pot of water to a boil. Cook the noodles according to package directions, about 5-6 minutes. Drain and rinse the noodles, then transfer to a large bowl. Wash the spinach leaves, then remove any tough stems. Place a small amount of water in a 4-quart saucepan set over medium heat. Add the spinach and cook for 8-10 minutes, or until the spinach is tender. Drain well, chop the spinach, and add to the noodles. Heat the oil in a large skillet. Add the chopped onions and saute until golden, about 7 to 10 minutes. Add the onions to the noodles and spinach and mix well. While stirring, add the eggs, oil, and salt. Mix well. Pour the noodle mixture into the prepared baking dish. Bake in the preheated oven for 35 to 45 minutes, or until kugel is firm, the top of the noodles have started to brown, and a tester inserted in the center comes out clean. To retain nutrients and add flavor, skip the simmer, and saute the fresh or frozen spinach in a large chef's pan with a little olive oil and garlic instead. Making a dairy meal? Add feta, goat cheese, or your favorite shredded hard cheese to the noodle mixture before baking. Make It A Meal: Serve this kugel with Brisket with Mango Barbecue Sauce and a side of Rainbow Slaw. For dessert, an Apple and Dried Cherry Crisp makes a nice finish.